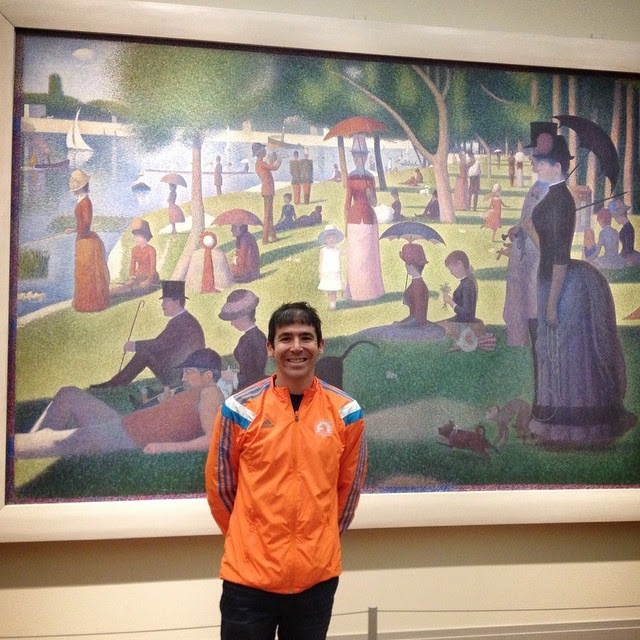 Ferris Bueller had his day off, and I had a weekend to recreate it. Encouraged by my father who loves the movie, and inspired by this website, I spent my first day in Chicago trying to visit many of the sights he visited. I had the day to myself because Laura flew in after work. After leaving my bag at the hotel, I went to pick up my packet and meet my high school friend, Tuere Wiggins, for lunch. We had some deep dish pizza near the convention center before I embarked on my route. First, I hit the Art Institute and took a picture of Georges Seurat's A Sunday Afternoon on the Island of La Grande Jatte. After the museum, I went to Sears Tower - excuse me - Willis Tower. While I tried to ascend, I was informed it was over and hour and $20. 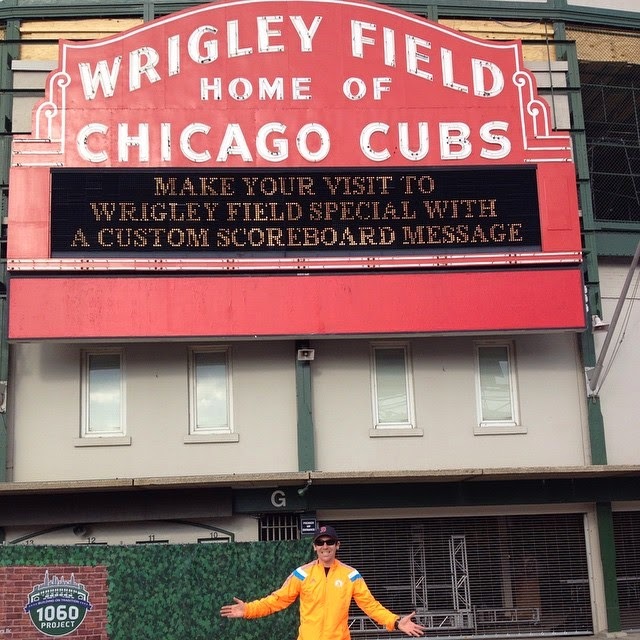 One or the other, but not both, so I went on to Wrigley Field. That night, I went to an Italian restaurant for some gnocchi, and read, watched baseball, and went to bed. Well, Laura arrived a bit late, so I woke when she arrived. 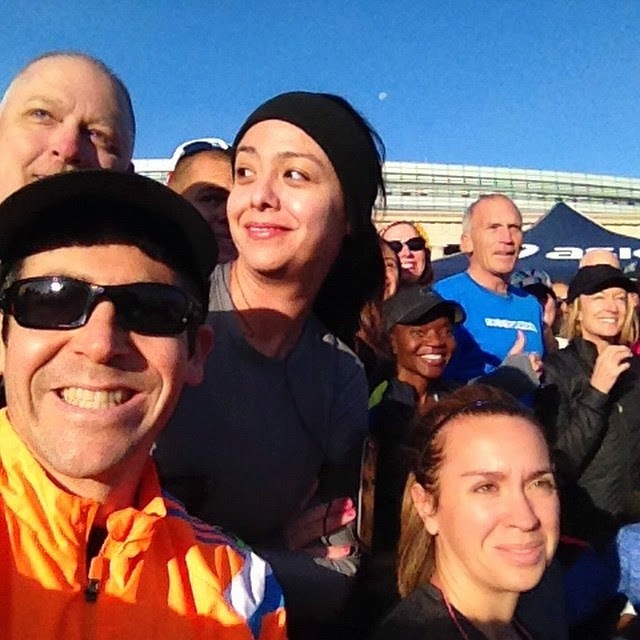 Saturday morning, I went to Solider Field for the shakeout run hosted by Bart Yasso and Deena Kastor. But, it was so crowded and I needed to get home that I left the run and headed back to the L.
We got brunch with Laura's friend, Emily, and then I went to bath in my hotel room and rest. For the pasta dinner, we went to Maggiano's and met Alex and Britt. Then it was a good night's rest and up at 4AM for the 7:30 start. I met Alex and we took a cab to the start. 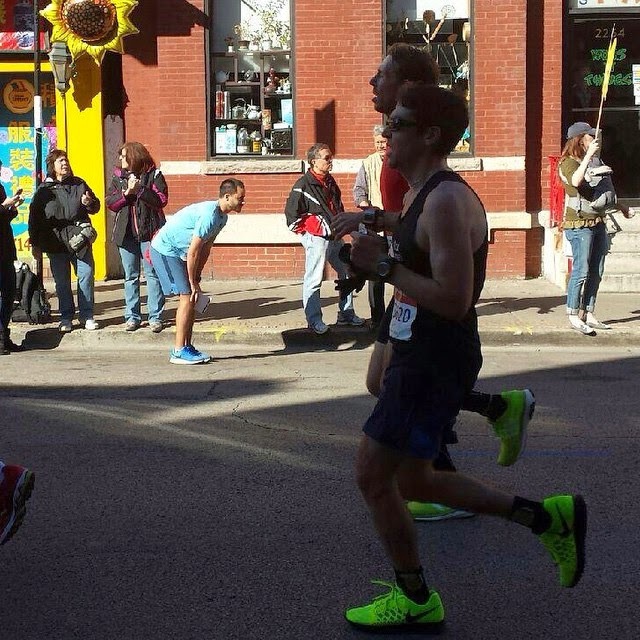 I tweaked my right calf walking around on my sandals, but that didn't bother me during the race. It crept up at mile 10, but I know it didn't hurt my time. 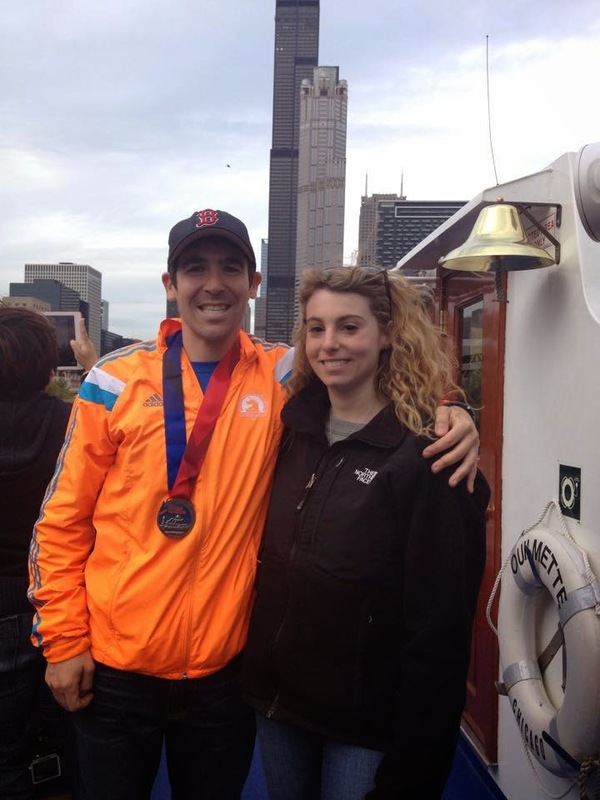 After waiting for the race to begin, we ran into Dan Burns who trained with us for DCRRC and ran with our team along with Joe Kane and Hirsh Kravitz. We warmed up and then tried to get to the start, but they wouldn't let us both into corral A because I accidentally got placed in B. I snuck into A, but I couldn't find Alex so we ran separately. After the race, I waited for Alex who was tended to for cramping. I met Britt, we left, went to the hotel room to shower, and went to Giordano's for deep dish pizza where Laura met us. After stuffing our faces with beer and the stuffed pizza, Laura and I went on a boat tour of the river to see the architecture. Then we walked around to Millennial Park, walked to John Hancock and got a drink at the top in the lounge (way too long a wait to go up and then to get seated), and then got sushi near our hotel. We left for DC early in the morning. I really thought I was going to go sub 3 today. I knew early on that I was nailing the miles even though my GPS was erratic due to the skyscrapers so I trusted it to even out which it did. Was going to run with Alex but we were separated at the start due to being placed in different corrals. It really was a flat and fast course. Our race team of Joe Kane, Alex Albertini, Dan Burns, and Hirsh Kravitz and me placed fifth in our category. Just a few miles to go!